Essential control/protection whenever AC from shore power or generators is on board. A double pole master breaker with power on indicator light protects both hot and neutral legs of the AC circuit. A reverse polarity light provides clear warning when wiring is reversed and poses a shock hazard. Single pole branch circuit breakers (Model AC-IX) and individual ON indicator lights provide control and protection of various AC loads. A label set of common on-board circuits is provided. 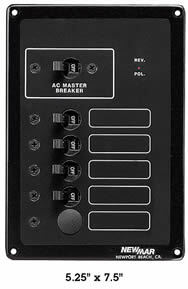 30 amp master breaker , 5 branch circuit capacity 4 installed standard 1-10A, 2-15A, 1-20A, or specify. LS-I Label set included. Panel size: 5 1/4" x 7 1/2", (13.3 X 9.5 cm. ).